Book now and save $8,960 per couple on stateroom categories 1, 2 and 3. 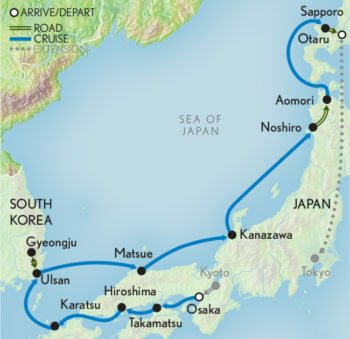 Join A&K for an unforgettable expedition cruise along a stunning breadth of enchanting, singular Japan, from the prefectures of Shikoku Island to the medieval trading post of Karatsu and surf-pounded Sado Island. Throughout your luxurious journey, select from intriguing excursions and enjoy onboard enrichment from our lauded experts, whose insight is second to none. Cross the International Dateline and arrive at Osaka’s Kansai International Airport. After clearing customs and immigration, meet your A&K representative and transfer to your primely located hotel. Spend the remainder of the day at leisure. Alternately, with insight from our experts, set out to explore Osaka at your own pace. Today, choose from a selection of tours, such as an enlightening, full-day excursion to Kyoto, where you visit the Golden Pavilion (Kinkakuji Temple); attend a talk about Zen Buddhism at Tenryuji Temple; and explore the Nijo Castle. Or, you may visit historic Nara, the first Japanese capital, including Houryuji, the country’s oldest temple. Alternately, pay a visit to a tea factory to experience matcha-making and tea brewing, followed by a visit to Byodoin Temple, a UNESCO World Heritage Site. Gather this evening for a welcome reception and dinner with fellow guests, and the A&K specialists and local guides who will be accompanying you on this enriching voyage. After breakfast at your hotel, enjoy the morning at leisure or join a panoramic tour of Osaka that includes a visit to the Dotonbori district and the imposing Osaka Castle, which towers above a moat and surrounding park. This afternoon, transfer to the port where you board luxurious ‘Le Soleal,’ your floating home for the next 11 nights. Throughout your journey, enjoy access to experts both on board and ashore, as well as ongoing conversations with our Expedition Team. Arrive this morning in Takamatsu, gateway to Shikoku Island. Choose from an array of intimate, thoughtfully planned excursions. Whether revolving around nature, gastronomy, arts or culture, each has been designed to reveal Japan at its most authentic. You may, for example, travel to Naoshima Island by ferry for a full-day excursion, celebrating its architecture and art museums. Visit the breathtaking hillside Chichu Art Museum and stop at Benesse House, a complex featuring unique work by Japanese and international artists. Alternately, board a high-speed boat to Shodoshima, or Shodo Island, the heart of Japan’s olive-growing industry for a full-day tour. You may otherwise remain on Shikoku Island, experiencing Takamatsu’s most acclaimed features. Begin with a visit to Ritsurin Park, one of Japan’s finest gardens. Next, visit the Kinashiarea of Takamatsu, among the country’s main bonsai production centres, where you learn of the traditional methods for growing and caring for these highly cultivated little trees. Spend the rest of the day at your own pace in the lovely port of Takamatsu, with time to explore the shops and enjoy the lively atmosphere. Return to the ship at leisure. This afternoon, ‘Le Soleal’ arrives at the port of Karatsu. Once an early trading post between Japan and mainland Asia, Karatsu still maintains its medieval heritage. Visit Karatsu Castle, known as the “flying crane castle.” Pay a visit to the Hikiyama Exhibition Hall, which houses the floats and artefacts used in the annual Karatsu Kunchi autumn festival, recently inscribed on the UNESCO Intangible Cultural Heritage list. You may also visit Ningyo Joruri (puppet theatre) and the Nakazato Taroemon Kiln, a ceramic studio that has been active since the late 16th century. Alternatively, visit the Kitahata Shige region to meet green tea farmers, along with the chance to pick your own tea leaves. Disembark and spend a full day exploring Gyeongju, South Korea, ancient capital of the Shilla Dynasty and a UNESCO World Heritage Site. Gyeongju’s cultural heritage dates back to the first millennium. Witness its excavated monuments, temples, tombs and pagodas, gaining insight from your cultural historian. Then, unearth the treasures of the National Museum, which houses an exceptional collection of jewellery, weapons and pottery. Sit down to a lunch of Korean delicacies and witness a traditional dance performance. Alternately, gain insight on South Korean culture and join a special visit to the Hyundai Motor factory. Return to Japan and disembark at Sakaiminato to visit Matsue, the “town of water,” nestled between a scenic lake and a large lagoon. Choose to explore the countryside, pausing at the Peonies Village to wander through its picturesque Yuushien Garden. Enjoy lunch at a local restaurant before visiting historic Matsue Castle, one of Japan’s few remaining medieval castles, built in original wooden form. Alternately, visit the garden-frocked Adachi Museum of Art, which melds the founders’ passions for art and garden design. Following a traditional lunch at a ryokan (inn), visit Yakumo-mura village to learn about the art of Japanese papermaking. Spend the day exploring the thriving art centre of Kanazawa, known for its Kutani-style pottery and gold-leaf workmanship, followed by a visit to Kenrokuen Garden, an Edo-period garden considered to be among the best in Japan. Or, choose a more active excursion that includes a hike in Kakusenkei Gorge; lunch at a local restaurant; and an onsen (spa) experience in the Yamanaka Onsen district, or a visit to scenic Shirakawa-go and the Shogawa River Valley. The next day, wander through its Omicho Market at your leisure, featuring everything from fresh flowers to fish and local handicrafts. Take a stroll in the Higashi Chaya-gai geisha district, where the slatted wooden façades of the geisha houses are still preserved. Tonight, join fellow guests for a private event featuring live entertainment before dinner. Travel off the beaten path and arrive at pastoral Sado Island, with its rice paddies, bamboo groves and surf-pounded seacoasts. Political exiles, deposed emperors and intellectuals were once “banished” to live in this beautiful setting. Today, enjoy an exclusive, private performance by the fabled Kodo taiko drummers. Next, visit the Hakusanmaru exhibition hall and Ogi Folk Cultural museum, followed by a farmer's talk at the rice paddies. Return to your ship and set sail for the west coast of Japan’s mainland. Disembark in Noshiro and head to Towada-Hachimantai National Park, passing en route through the panoramic mountain plateau region of Hachimantai. Visit the Great Drum House to witness the drums used in the Tsuzureko Shrine Festival. Then, hike or take a boat ride at the ancient caldera of Lake Towada, formed by the eruption of a volcano. For a more in-depth nature experience, you may choose a trekking excursion to Juniko Lake alongside an A&K naturalist and a national park nature guide. Later this afternoon, re-board your vessel in Aomori. Arrive in Hokkaido, Japan’s northernmost island. Shortly after lunch, disembark in Otaru, a picturesque city known for its canal, well-preserved architecture, handicrafts, sake distilleries and stunning views of Mount Tengu. You may opt to take a historical and cultural tour of the city, once a prosperous fishing village. At the impressively crafted “Herring Mansion,” learn the history of the prominent Aoyama family. Afterward, discover Otaru’s storied glassmaking and visit a sake distillery, where you may sample its rice wine. End with a visit to the city’s historic canal; once filled with fishing barges, it is now lined with museums and shops. Or, choose to visit Mount Tengu by gondola, taking in panoramic views of Otaru Port and Ishikari Bay. During a leisurely walk on top of the mountain, you may see the 100-year-old cherry tree. Visit the Tengu House, where nearly 700 goblin masks from throughout Japan are exhibited, before your descent back to the city to see the famous canal. Spend the evening in port in Otaru. After breakfast on board ‘Le Soleal,’ disembark in Otaru, where you transfer to the airport in Sapporo. Board your homebound flight, join the post-cruise group extension to Tokyo or continue onward with your independent travels. First group event: morning excursion on Jun 14. Last group event: disembarkation in Otaru on Jun 26. Prices are per person based on double occupancy. Internal and international air not included.